Caledonia Brand Valencia Orange Crate Label, Placentia Mutual Orange Assn., Placentia, Orange County, California. 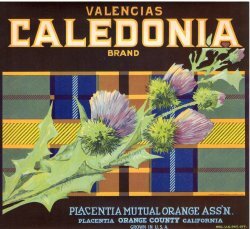 Caledonia Brand Vintage Valencia Orange Crate Label. Original 1930's Caledonia Orange Crate Label, from the Placentia Mutual Orange Assn., Placentia, Orange County, California. It pictures Scottish Thistles on a plaid background. Label measures about 10" x 11" and it is in mint condition.